Please feel free to contact us for all of your cookie needs by phone or email. We are happy to discuss all our of our cookies and help you put together a good selection of Italian & Sicilian cookies. We also bake traditional American cookies and Pizelle on request. All cookies are $8 per dozen with a minimum of 3 dozen per order. Gift tins of two dozen cookies are available for $20 each. Cookie platters for events can be delivered in the area (Erie, PA to Buffalo, NY). 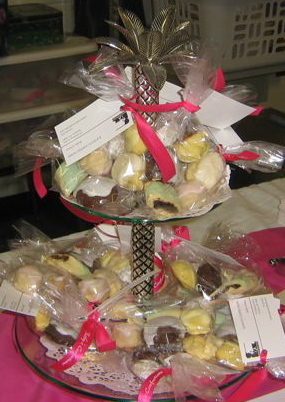 A large variety of cookies can also be shipped for you to put together your own platters. Shipping is additional. Discounts are available for large orders. I ship via USPS and Fedex, and can provide shipping quotes to determine which one you would like to use. Please place all orders by phone. Payment available by PayPal or check. Please fill in the fields below to receive our seasonal newsletters and special offers. You may also send us your orders through this form if you like. Please be sure to include your mailing address.